The Dirty Spoon News Hour and Online Journal will share the highlights of my exploration of culture and sense of place in the Arkansas food scene. Tune in this Friday 6.15 4 pm EST on 103.7 WPVM for a reading and check out the full article on DS’s online journal. Check out @newbookcovers for Spring reading inspiration! 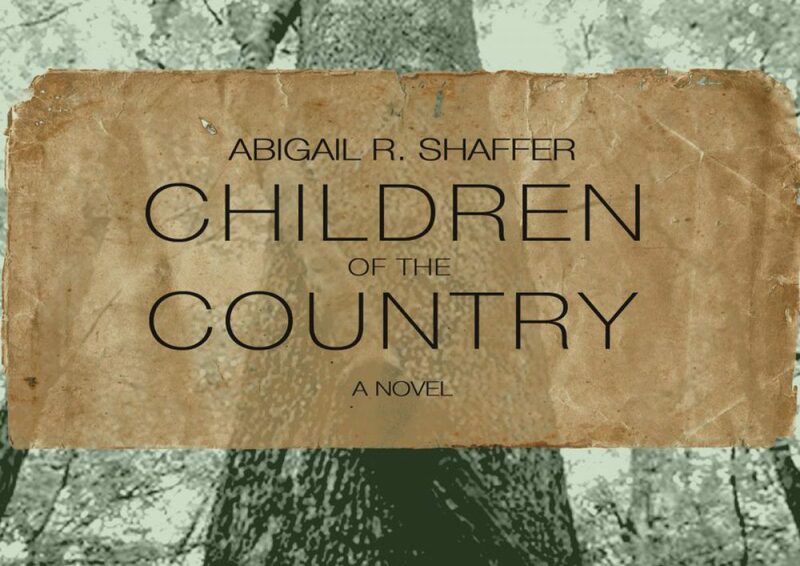 Whether you want a head start on holiday shopping, to perhaps treat yourself to a fireside read on a late Autumn evening, or maybe simply just snag a book, enter my Goodreads giveaway to win a copy of Children of the Country. Giveaway runs between 11.8.17 and 12.8.17. Cheers and happy reading! Welcome! The long-awaited feature post is finally a go! Artistic expression doesn’t occur in a vacuum: expression through creation, desire, or, say, an encompassing dénouement, feeds and nourishes, can sustain, forge, and sometimes draw quarter for one’s soul. To me, expression in all its amazing forms is vital to the human experience. In this new regular feature post, my endeavor is to connect with writers, artists, musicians, and sundry folk gracious enough to share their amazing creative stories. Let’s discuss the stuff of life that feeds us. For this debut post, some backstory: a character’s identity defined by sense of place – which I’ll define as how locale, setting, place, and oftentimes regionalism shape the character and story as a whole – has been a subject of my attention (an obsession, if you will) nearly my whole life (even an MFA craft thesis!). Moving around frequently, obsessing over ancestral roots (old family legends and 23andMe! ), forging an identity in relation to the place I live, and more often than not, the places I wish I live as the characters I wish I could be and strive to write, has shaped and infused my work – and my identity. Sense of place has affected and defined who I am, both as a human being and as a writer. I reached out to my friend, Brazilian-born writer Gisele Firmino, about how connection to place affects her identity and her writing, particularly in relation to the writing of her novel, The Marble Army. Abigail (A): In what ways has your background influenced your identity as a writer? Gisele (G): I think the main reason why I feel I have something to say is because of where I come from and where I am right now. I grew up in Brazil, and even though I’ve lived for many years in the US, I still feel as though I’m in a sort of cultural exile here. But when I go back, for instance I lived in Brazil between 2011 to 2015, I still feel the same way. This constant sense of displacement, regardless of where I am, is always there. A: You wrote The Marble Army in English and mentioned it’s difficult to translate into Portuguese. Tell me about the translation process. What’s one of the more difficult aspects? Is it the emotional experience/difference in expression between the two languages? G: Possibly a little bit of both. I feel like the distance between colloquial or spoken Portuguese and written Portuguese is greater than what we experience with English. Sometimes, in order to meet minimum standards of written Portuguese, I fear I might need to sacrifice my narrator’s voice. I’m from the south of Brazil, for instance, where we’re constantly ignoring proper verb conjugations when we speak with one another, but that’s not really acceptable when you’re writing. So, finding a balance has been challenging for me. Emotionally, I’ve always thought writing in English enriched this idea of nostalgia in which Luca, the narrator, exists. An inevitable distance between what he envisioned for his future, and how things actually turned out. He looked to the past as if it belonged to a completely different world, and I always thought, hoped, that writing in English could add another layer of distance. A: Why might TMA lend itself well to English? G: I’m not sure why I feel this way; maybe because that’s how I wrote it first. It took me almost 10 years to write TMA. You hear these voices for such a long time it’s hard to imagine them differently. I understand all these characters must speak Portuguese, right? It has to be natural for them to speak Portuguese – it’s where they are from. But it’s kind of like when I moved to Los Angeles for the first time, and heard some of the cartoons I grew up with no longer dubbed in Portuguese. I’ve always known they were made here, in the US. I’ve always known we didn’t watch the ‘original,’ but it was still odd to hear them speaking English after listening to them for so long. I’ve always written for myself, but never in English. My first attempt was in 2004, I think, when I was living in Los Angeles, as an effort to improve my English. And I fell in love with the language. English felt more honest to me, more authentic. My characters and my narrators could sound the way I’ve wanted them to sound. But I think when you write in a second language, there is also a sense of reinvention. I express myself differently in English. So, in many ways, you’re not just creating a new world for your characters, but you’re creating a new writer too, a new person. And this idea, to me, is very liberating and exciting! A: Agreed! How has bridging multiple cultures and languages affected your own writing? In what ways does it enrich? G: Writers such as Edwidge Danticat, Julia Alvarez, Jhumpa Lahiri, Rigoberto González, and Junot Díaz have not only inspired me tremendously, but also shown me it was okay to write about where I come from, to explore and expose worlds an English speaking audience wouldn’t necessarily be familiar with. That it is okay to be proud of such origins, while also being critical, now that we have gained some distance from these places. That idea informs my process and everything that I write, and I am constantly aware of the things that separate and unite us. To me, all writing is political, and every time I choose to portray or ignore a character, I am making a political choice as well. So, absolutely! It certainly enriches my writing process. I don’t know if it actually enriches the writing itself. I really hope it does! But that’s for the readers to say. A: How might this connect to sense of place? And indeed – I also believe all writing is political. Do you think if you were, say, in Brazil, and immersed in Brazilian culture and the primary language infusing your environment was Portuguese, do you sense that your translation perspective might be influenced by place? G: Maybe. But I was living in Brazil between 2011-2015, and I continued to write creatively in English only. I’ve spoken to other authors who write in their second language, and more often than not I hear it’s almost impossible to translate one’s own work. I can write perfectly fine in Portuguese, but I struggle to write creatively for the same reasons I mentioned earlier. It’s not an easy language. And even though I also struggle with English, when I think creatively, when I’m writing something in my head, I’m thinking in English. A: As far as Latinx writing, not to generalize, but when I read writers like Gabriel García Marquez, Julia Alvarez, Isabel Allende, as well as Caribbean writers like Maryse Condé, Jean Rhys, and Nelly Rosario, place and landscape and surroundings are lushly infused and reflected in the prose. It’s like place and identity are synonymous – and elevated to the mythical. Same goes, in my mind, for Tejano/Chicano writers of the American Southwest: Rudolfo Anaya, Denise Chavez, Alfredo Véa, Jr. What I’m calling the mythic – or magic realism – seems such an integral part, at least in my mind, to sense of place. To me, this spirituality/place/land infusion is almost like a calling or a draw to the ancient past. Subjugation and conquest, old magic, families and falling kingdoms whisper from a story’s vegetation. It also plays big time into Children of the Country. I’m wondering if it’s simply infusing a sense of place with spirituality? Like delving into the spiritual is also delving into place. G: Yes! Totally agree. I don’t think we can isolate identity from place, and we’re probably most aware of this when we are removed from home. I guess we all look to the mythic/spiritual to situate (place) ourselves – to understand where we came from, how we got here, where we’ll go after, and the meaning behind the whole thing. I wonder, though, if this infusion of mythic or magical realism in writing doesn’t have to do with how willing certain places and their people are to allowing such infusion in their daily lives. Superstition is so rich with surrealism. A: Nowadays, however, I don’t feel that call coming from where I currently reside – no huge cultural identity specific to place. This is significant for me both personally and as a writer because I’ve always thought of characters as kind of molded of the earth from which they were birthed – for better or worse. Myself, too. I live where I live, and the land shapes me. In retrospect, I can see this manifesting in CoC, in that most of the characters are pretty much wholly consumed by place. Sheri, Kelly, and Walter most definitely. And poor Ricky. Cindy Rae, though, she’s different. Maybe Treecie, too. Recently, I’ve been of a mind to blaze forward, to completely reinvent myself – particularly as my third mss begins to foment. Regardless, I would say there is often a sense of yearning and longing that manifests in my characters, and it often has to do with place. G: No doubt. Having moved so many times and being away from home, I certainly identify with this feeling you mentioned that we/I might lack a cultural identity. But the way I feel about this seems to change constantly. G: I think there’s a benefit to letting go of what makes us so culturally distinct from one another; maybe it facilitates coexistence, maybe it proves how much empathy we are capable of showing. Of course, more often than not, there is emptiness and loneliness, and a need to seek and define such identity, whether it is the one I might have inherited or the one I might be trying to create for myself. I guess what I’m trying to say is this longing and yearning isn’t just limited to whatever answers the past might hold. So. Here’s to blazing a new future, buoyed by the past but embracing our ability to let go. Join the conversation! How does sense of place connect with your creative work/expression and identity? How does it connect with your identity? We’d love to hear your thoughts! Gisele Firmino is the founding locale coordinator for the Queens University MFA in Creative Writing: Latin America and author of The Marble Army. She divides her time between Brazil and the United States, and I am over the moon she agreed to explore this theme of place and identity with me. abigailrshaffer.com Create a free website or blog at WordPress.com.